Gorgeous, firework-like flowers in spring and summer. Supplied as an established plant in 3L pot. Height after 5 years approx. 1m (3ft). 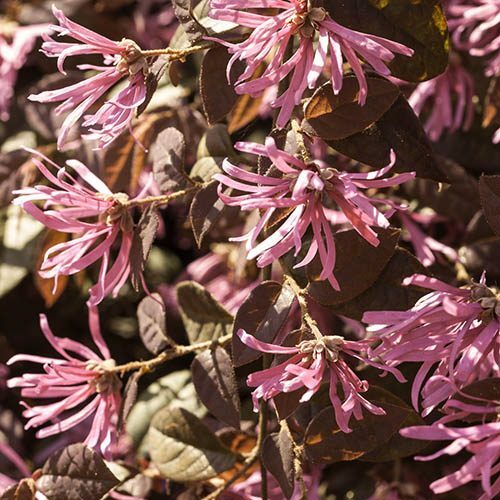 Known as the Chinese Witch Hazel, Firedance produces masses of spectacular, firework-like flowers. A plant for all seasons and for all garden, the Chinese Witch Hazel, 'Firedance' really is one of the most spectacular plants you can own! Incredibly exotic looking this highly prized beauty is actually very hardy and easy to grow. Its glorious, rich burgundy, oval shaped leaves contrast superbly against any green foliage. Often likened to sea coral, the highly unusual ribbon-shaped petals, explode from the centre just like a firework. Supplied as an established standard plant 90cm tall in a 3L pot ready for immediate planting.